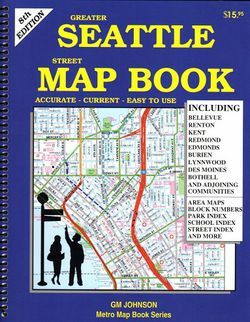 Updated Seattle Street Atlas much like a Thomas Guide. Double lined street atlas of the greater Seattle area including Bellevue, Burien, Des Moines, most of Kent, Sammamish, Redmond, Bothell, Kirkland, Lynnwood and other surrounding communities. The Seattle Map Book shows complete street detail, block numbers for address finding, schools, neighborhood names, parks, lakes, rivers and even a few trails, like the Burke Gilman. 112 pages including a detailed index with address finding, spiral bound.